New-Folk Poets Bright Eyes Hear Bright Eyes perform live from Washington D.C.'s 9:30 Club with special guests Tilly and the Wall and CocoRosie. This concert was originally Web-cast live on NPR.org from Washington, D.C.'s 9:30 club. Hear full performances from Bright Eyes, with guests Tilly and the Wall and CocoRosie. 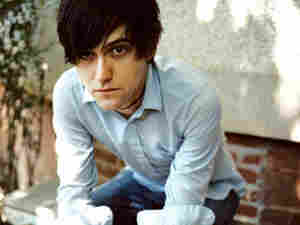 Bright Eyes frontman Conor Oberst has been called the voice of his generation. Now 24, he's been writing and recording an introspective blend of new-folk and electronica since he was 14. He also helped start Saddle-Creek records out of Omaha, a fiercely independent label that's quickly becoming a major distributor of experimental and progressive rock. Tilly and the Wall, also from Omaha, feature Jamie Williams as their percussionist, a tap-dancer whose amplified stomping and clapping keep the beat. CocoRosie are sisters Bianca and Sierra Casady. They recorded their wildly experimental album La Maison de mon Reve while living in Paris.